Michael Bram by day serves as Grammy-winning singer/songwriter Jason Mraz's drummer and by night has launched a solo career releasing his latest solo album Suitcase In The Hall through the VizzTone label. Those looking for a carbon copy of the more widely known Mraz and his pop-oriented singer/songwriter sound may be disappointed but careful listening reveals connections beneath the surface of his roots-oriented sound that mixes blues and country leanings with solid songwriting. Bram plays many of the instruments on the album and wrote the majority of these tracks. He gets some instrumental and production help from the multi-talented Dave Gross and also gets a former member of Ryan Adams' Cardinals, Cindy Cashdollar, to contribute some fine steel and lap steel guitar. "It Don't Matter Where You Get Your Appetite" echoes Robert Plant & Allison Krauss' "Rich Woman" from the Grammy-winning Raising Sand. Gross' production borrows often from that wonderful T Bone Burnett set without forcing the atmosphere. Bram's country influence comes through with an excellent reading of Kris Kristofferson's "Nobody Wins," just one of the celebrated songwriter's fine tunes. "Got Love If You Want It" is an oft-covered song and while Bram hasn't created the definitive version, he finds a very comfortable place inside it and delivers an excellent performance. The same can't be said for his run at the Howlin' Wolf classic "Howlin' For My Darling." Bram doesn't make the mistake of attempting the impossible, imitating Wolf's unique voice, but doesn't succeed at inhabiting this one the way he did with "Love." Ge finds a better vehicle for his brand of blues with the title track, a shuffling track with some solid harp work and snappy guitar lines both light and slashing and the grinding "Chinese Hot Mustard," a groove that rocks the blues rather than becoming a predictable blues-rocker. "I'm Going Away" deploys accoutrements of New Orleans-influenced rags and gives the album yet another set of sounds to consider. 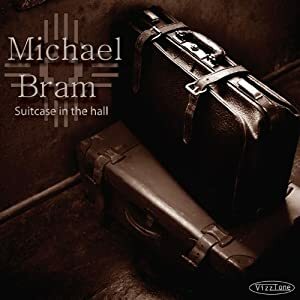 Bram isn't the kind of artist destined for stardom and Suitcase In The Hall isn't the kind of record that creates pandemonium among music fans but it's just the sort of album you consider yourself lucky to find.